A shop has lost its licence after pupils were said to have bought vodka and drunk it before going to school. 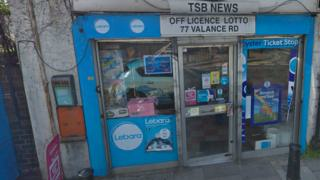 TSB News was found to have sold alcohol to underage girls from Mulberry Academy Shoreditch and Oaklands Secondary School in east London. Mulberry Academy, previously Bethnal Green Academy, was attended by Shamima Begum, who travelled to Syria in 2015. At a meeting on Tuesday afternoon councillors rescinded TBS News' licence. A Tower Hamlets council spokesman said: "We act swiftly to enforce against premises illegally selling alcohol in our borough." The shop, in Vallance Road, first came under suspicion in November 2017 when a student arrived at the school intoxicated, according to the Local Democracy Reporting Service. Another girl was found to be drunk in her morning class at nearby Oaklands Secondary School on the same day and ambulances were called for both pupils, police said. Teachers said they smelled vodka on the girls' breath and called safer schools officer PC Simon Lambert. He said: "[There are] numerous occasions when female students attended in a state of either partial or extreme intoxication. "The shop is known to students as a venue where you can buy alcohol regardless of your age." Mulberry Academy was the subject of media scrutiny in 2015 after Ms Begum, along with Kadiza Sultana and Amira Abase, left the UK in February 2015 to join Islamic State. Following the press attention the school changed its name to Green Spring Academy Shoreditch. After an exam malpractice scandal in 2017 it changed its name again and became Mulberry Academy in September. Dr Vanessa Ogden, CEO of Mulberry Schools Trust, said: "The academy ensures that all its young people are thoroughly safeguarded and therefore deals robustly with those who supply vulnerable youngsters illegally with alcohol, reporting such matters to the police immediately."